A black and white photograph of Ontario County Warden Russel Francis. 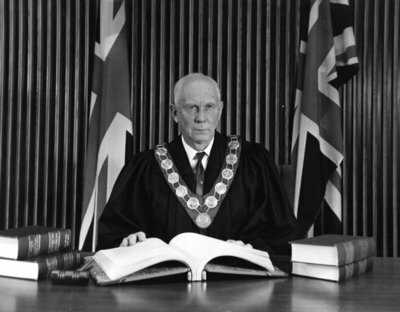 Russel Francis, Warden of Ontario County in 1964, was Reeve of Thorah Township. This picture of him seated at his desk in the new County Courthouse on Rossland Road, was printed in the program for the official opening on September 30, 1964. Ontario County Warden Russel Francis, 1964, Photographer Unknown. Whitby Archives 07-005-047.